These gloves fit comparably to other major brands of gloves, so select the size you normally wear. 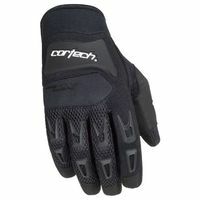 The DX 3 glove by Cortech is a refresh of the LONG RUNNING DX glove line by Cortech. These gloves are a great, lightweight glove for warm weather riding. They are durable, light weight and pack away easily. In this version of the glove I see an improvement in overall build quality… The construction is crisp and the materials look to be top notch. Also, the “hook” part of the Velcro closure at the wrist is the non-snaggy kind so they won’t stick to your jacket and shirt. When I tried them on, they were in a perfect fit in the size XL which I usually wear. The stretch panels between the fingers and the flexible fabrics they are made out of will require no break in and provide a great feel. Neoprene is used over the knuckles for a little padding, and the neoprene cuff is very comfortable against the wrist. Mesh panels allow plenty of airflow, while rubberized details on the back of the hand add to the sporty looks. The palm is made from Clarino, which is a synthetic suede like material, with a reinforced, padded palm. This material is thin and flexible, and provides very good feedback from the controls.